It’s been nearly a month since the last post — at least in part because I changed my mind about how I wanted to treat this section in mid-painting (the last post shows a very early stage of that) — and scrapped it. Here’s very quick, pretty warped photo of the Hebrew page of this section, and hopefully I’ll get the English page posted late next week. This page introduces the character of Deborah. Our first glimpse of her shows the judge and prophet holding court under the “palm tree of Deborah,” speaking with anxious Israelite farmers alarmed by the predations of the Canaanite army led by Sisera, whom we saw in the first illuminations. The initial word (her name) is shown against a painting that introduces her, while the bar across the middle of the page shows Deborah and her general Barak leading the Israelite tribes into battle — the English page will introduce Barak. The smashed and spilling jars of grain and wine shown below on this page tell us of the damage left by the Canaanite raiders. Check back next week. On a related note — the Metropolitan Museum of Art in New York is presently exhibiting the very important and glorious illuminated manuscript in Western civilization, Les Belles Heures du Duc de Berri, which is still unbound (and available for full exhibition) following restoration work. My “me-to-me” gift when I finished my graduate work at MIT (poli sci) was a facsimile of another, even more remarkable manuscript by thesame artists (who were teenagers when they made this one)…which should have told me something then about what I was supposed to do with my life! GO! In designing my paintings, it’s important to me to use imagery reflective of the era I’m depicting to convey the subtle meanings borne within the text. The archeology of the period thus becomes an essential element in my visual interpretations of biblical text. Here you see a detail that I’ve just finished painting (there’s lots more work to do on this page). Here you see a palmette design based on an ivory carving in the collection of the Israel Museum, from 9th to 8th century BCE Ramat Rachel, near Jerusalem. It was made a little later than the events of the story, but similar designs were in use in the region as far back as the 3rd millennium BCE. Why did I choose this? 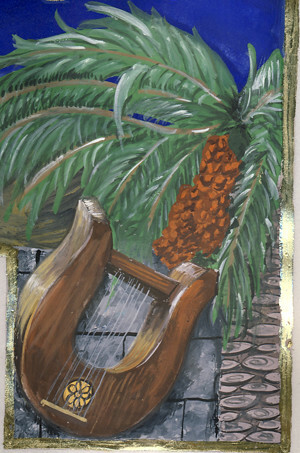 First, Deborah sits under a palm, as the text on this page tells us, so this is a symbol of her (and yes, my own) presence. Second, in Psalm 92, the tall, straight palm is compared to the righteous person, whom she of course exemplifies. I also frequently use this palmette design to allude to Solomon’s Temple, whose decor is described as including such designs (for instance, it appears in my Psalms book several times). The pink stuff on the initial word “Deborah” is an undercoat of my gilding medium. That word will later be gilded with 23KT gold leaf. I’ll show you the full page after I complete it. Interested in watching the birth of a new illuminated manuscript? 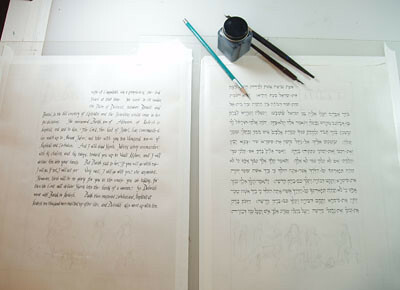 Join me then to watch the progress of my new illuminated manuscript of the biblical stories of Deborah, Ruth and Hannah. These three stories — Deborah (Judges 3-4), the full Book of Ruth, and Hannah ( I Samuel, 1-2) — compose the full extent of specific women’s narratives in the Hebrew Bible. And each offers a wonderful window onto the lives of very different women in 12th century BCE Israel, a few generations prior to the establishment of the Israelite kingdom. And different they are! Deborah tells of two women heroines’ (Deborah and Yael) deeds in a tale of defensive battle…culminating in a vivid epic war poem with a gory and surprising victory. Megillat Ruth tells the survival story of a young widow who, along with her thrice-bereaved mother-in-law, becomes the ancestress of King David through a series of acts of profound kindness. Finally, the very prophet, Samuel, who would later identify and anoint King David is the miraculous, God-given baby of the childless Hannah. Wonderful stories, with an extraordinary scope of human emotion, national significance and spiritual depth. But there’s a “back story” here. This book has a profound personal significance for me. All of these stories track back in one way or another to my late husband, David Band, who was taken from us by spinal cord cancer in March 2009. The Deborah story doesn’t just trace the heroism of my namesake; her two chapters of Judges were David’s haftarah (yes, that’s one of the ways we figured our marriage was baschert), and did he ever enjoy chanting that poem! Ruth presents the genealogy of his namesake, and Hannah’s son Samuel, of course, identified and anointed that storied king. This book, which will be another collaboration between me and my beloved father-in-law and mentor, Arnold Band, is dedicated to David’s memory. The work is supported in part by a grant from the Memorial Foundation for Jewish Culture. So join me as I bring to light these tales of adventure, love and fulfillment. Check back every now and then, and let me know what you think! PS If you would like to learn something about the man to whose memory this work is dedicated, please visit David’s website. If you, or someone you love is battling cancer, you may wish to read his several years of remarkable e-mail progress reports sent to friends around the world. The link is at the bottom of that page. Take a look at the first pair of finished paintings? These are the opening pages of the Deborah story, from Judges.